Back in June, our free call at GoodVibeAstrology.com was about the magic of time and how it expresses through retrograde planets. Neptune and Mercury were the focus as Jeannette and I discussed how we can all leverage Rx energy for the greatest benefit. Tomorrow, we are going to revisit this topic, with Neptune now direct. We know that Neptune is about loosening up our grip on ‘what is’ and allowing for more of what we want. Mercury is all about our thoughts and how we manage them. Now with Mercury and Neptune both traveling direct again, we are going to revisit those letters we sent to ourselves (you can open yours now, before the call) and play with the thought experiments we want to engage with in the future. Tune in and learn more about where this energy is activating your life. Bring your charts, and make sure they are up on the GVA forum so all can see. To do so, become an Open Member (it’s free) and post your chart in the Gallery. Tutorials here on how to. Over at GVA we’re taking sign ups for Path to Abundance, a course that is perfect for getting your $$ and abundance vibe correct through astrology and law of attraction. We were so excited to embrace the vibe of abundance, we made the course ‘Pay What You Want’. All welcome. Input the price that suits your budget and we’ll see you there. The Weekend Astro-LOA Flash highlights Neptune turning direct with the words allow, allow, allow . 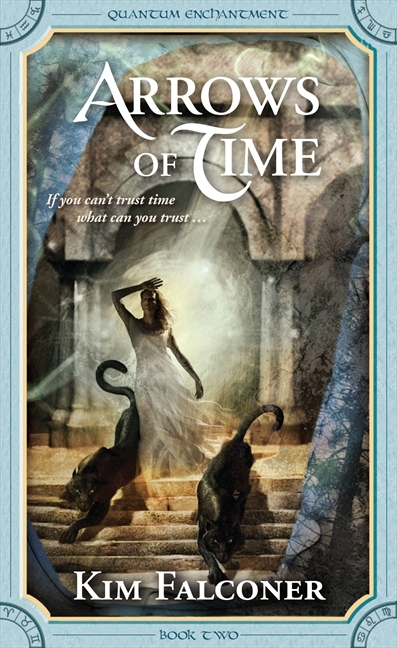 . . and to exemplify the experience, I though to share an excerpt from Arrows of Time. Here Maudi, by the entrance. You never could see well at night. So it’s not just because I’m dead? I don’t think so . . .
Rosette wanted to sigh. She felt the sensation, like an exhale, a wash of relief, but she had no physicality to perform the action—no way to express it. I don’t know how I’m going to get used to this, Drayco. This non-corporeal state. I hope so . . . She wanted to wrap her arms around her familiar and squeeze him tight until his tail lashed and she risked a swipe of his massive paw. She wanted to erupt into deep belly laughter and feel her heart pound against her breast bone. She wanted to cry, letting the well of emotion overflow from her eyes. She couldn’t do any of these things and the realization caught her head on. Maudi! Think of what you can do, not what you can’t. For example? She knew her voice sounded sulky. Finally you can keep up with me. There it was again, the desire to laugh. But she couldn’t laugh, or sigh or cough or smile, or touch or hug. Find a reference, Maudi. A point of entry,her familiar suggested. He was so practical. She loved that about him. An astrological reference? Like what sort of transit this might reflect? Exactly. Drayco looked in her direction. I’m guessing Neptune? She exclaimed but no sound came out. Of course! Perfect! Neptune transiting in opposition to my sun. That’s it. You’re brilliant. She felt her energy whirling about like a dust devil stirring up leaves. Neptune rules the sea, a place where there are no boundaries. In Neptune’s world all the sharp edges, the lines that distinguish one thing from another, are blurred. He’s the god of immersion, the god of dance and ecstasy, boundless love and union with the divine. The god of enchantments and also deceptions. She felt laughter welling up from some deep place of awareness. I know I’m meant to let go of attachments and identification with material ‘reality’ but this is a twist I didn’t count on. An interesting one, don’t you think? Very. Neptune makes sense. Everything is dissolving, melting away so I can see who and what I am without the props. Great goddess of the woods, I never thought of my body as extraneous. This gives me a new perspective on consciousness. Indeed, me too . . .
To experience Neptune’s gifts, we have to dive into the sea and feel ‘life’ in a completely new way. No resistance. No pushing against. Where is Neptune transiting direct in your chart (at 0 Pisces – here’s a video tut)? What house? Aspects? Any revelations of consciousness there? Let us know in the comments! Prep for an intense, magnetic and magical month the likes of you haven’t seen all year. It begins the Mercury turning retrograde on the 6th. Just think serendipity a la The Three Stooges. Seriously. You have to laugh, because there’s no point in crying over spilled milk. What there is a point in is being reflective, investigating your motives, asking what any ‘hang up’, slow down, snafu or hitch in the get-along is actually ACCOMPLISHING for you. At first you might want to shout ‘nothing!’ but I promise underneath it all is a message or desired results. Use this time wisely and find what lies beneath. It’s mostly in Scorpio after all. Dig deep! Neptune direct on November 11th, a 0 Pisces, reanimates any projects or ideas started in February 2012. Take notes, think it through and be ready to sign contracts or launch exciting new creative kittens in December. No need to rush and try to ‘make it happen’ before then. No forcing it. The Solar Eclipse on the 13th is the first eclipse of the month and highlights the 21st degree of Scorpio. Spot where that is in your chart so you can identify the house and aspects linked to this major celestial event. I’m devoting an entire call to the eclipses this month, so tune in for more details coming shortly. Basically this is a ‘super new moon’ and it’s going to be an amazing energy to set potent intentions for the future. You may not necessarily act on them immediately, but talk about pre-pave! Chiron turns direct the next day so cue up a fresh direction for something initiated back in June 2012 for maximum results. Venus into Scorpio AND Sun into Sagittarius on the 21st lights a warm and friendly campfire, but things aren’t really going to flow super fast until Mercury turns Direct on the 26th (and I would make it more like early December, after the hot zone Lunar Eclipse on the 28th!) The snake will shed it’s skin! Note where 6 degrees of Gemini and Sagittarius is in your chart for clues of what, when, where and how to let go over this full moon eclipse. Big changes! To sum it up, this is a month for observation, awareness, pre-paving and thoughtful, unhurried actions. Enjoy everyone and let us know in the comments what you are up to. PS Everyone, in answer to caitlinmowbray758 in the comments, the best way to look at the eclipse, or any transit event, is to plot it around the natal chart, just as you would in a synastry (when comparing the charts of two people).